GOin is an institutional-grade investment and trading platform which will provide fully licensed tokenized financial instruments to institutional and private investors. Blockchain technologies need institutional money. They are the most effective technologies to guarantee and trace exchanges of value and data in a totally transparent environment. At the moment, user-experience, scalability, security or interoperability of blockchains are still topics preventing their massive deployment in traditional activities. Solving these problems requires fundings. Operating blockchains on mass markets requires significant fundings. Institutional investors are needed to bring these technologies to the next level. 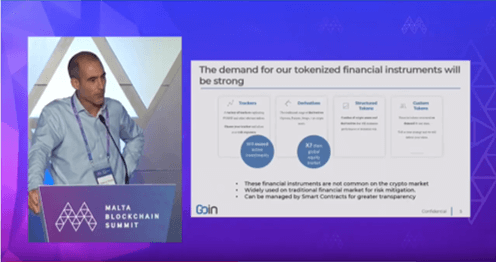 By offering fully licensed and supervised financial instruments, GOin will be a gateway to the crypto asset market for institutional and private investors. GOin opens a new phase of exponential growth in the funding of blockchain projects with concrete applications on traditional mass markets (Industry, Healthcare, Transportation, Energy…) and returns on investment appreciated on actual project usages. GOin provides tokenized financial instruments (trackers, derivatives, structured or custom products) that will be available on the highly secured and regulatory compliant GOin platform. They will be issued in the form of financial tokens for greater transparency and liquidity on the secondary market. With the variety and quality of the financial tokens offered by GOin, each investor will easily build the approach best suited to his financial objectives. Governing financial instruments with smart contracts is extremely powerful. Our tokenized financial instruments can be managed by smart contracts.Issuance or redemption mechanisms can be automated. All relevant data and information (such as circulating supply, underlying assets, NAV, fees) can be stored on-chain and made publicly available in total transparency. This is a massive step forward for the financial industry. FUSEKI indices were created to take full advantage of the performance of crypto assets, overperforming reference currencies such as Bitcoin and Ether. Former investment banker and trader of equity derivatives at BNP Paribas, Tangi completed numerous M&A transactions, IPOs and successfully managed a derivatives portfolio worth €2bn in nominal value in the midst of the 2008 financial crisis. He also held CFO positions for several tech companies, Tangi brings his knowledge of financial markets, structured products and new technologies. Former developer, CTO & CEO in several software and IT consulting companies, Emmanuel developed a strong understanding of banking IT infrastructure and platform developments. He also held CHRO positions in several tech companies and brings his HR management skills to the project. After 8 years spent at Vivendi Universal where he hold several managing roles, Benoit worked on positions with strong digital involvment : first as Marketing Director and Worldwide Operations for an Internet startup, then as Worldwide e-commerce Director. Before joining GOin, Benoit was Marketing Director of one of European vocational training leaders. Former blockchain developer and architect in ENGIE and BNP PARIBAS, Guillaume spent the last four years working in the blockchain ecosystem. He gained some of his experience working for several blockchain companies in the last few years. He started working around bitcoin technology before switching to Ethereum and Corda technologies. Guillaume has also a strong knowledge in financial engineering, he gained working in a hedge funds in the past. Serial entrepreneur, inventor of time-shared management, Stéphane held CEO & CFO positions in more than 50 tech companies and led numerous private and public equity financings for a cumulated amount of €0.5 bn. Stéphane is CIF and brings his knowledge in managing and structuring high growth companies. Former investment banker specializing in tech companies, Vincent has advised and completed over 50 transactions such as mergers and acquisitions, private equity financing, Initial Public Offering, etc. Currently, Vincent held CFO positions for different tech companies. He brings over 12 years of experience in corporate development and a strong knowledge of the technology space. Hubert de Vauplane co-leads the Alternative Investment Management practice in the Paris office at Kramer Levin Naftalis & Frankel. Hubert provides legal counsel on fintech, blockchain and cryptocurrency assets, and financial regulatory issues relating to investment advice, asset management, payment services and banking. Hubert is expert at the French Financial Market Supervisory Authority (AMF), as well as European Commission and European Central Bank. Consultant Legaltech | Fintech |ndex Payments at Bitcoin Inc. and ICO analyst, Naïm bring a strong experience in ICO project management. He provides investment strategies advice, in blockchain and crypto-asset market with his legal and fiscal expertise. Tangi, our CEO, introducing GOin to the most famous family offices. A lot of questions and a warm welcome from the attendees. 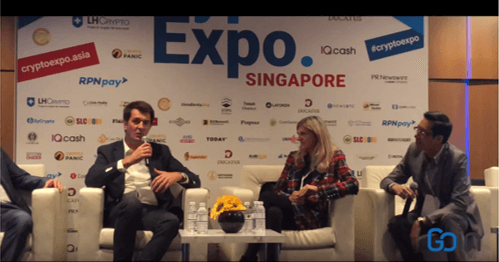 Frederic our Head of Trading spoke about the development of blockchain usage and why it requires institutional money. Tangi our CEO presenting GOin during Token Match in Barcelona.